Feel like everybody but you is going to drink alcohol this St. Patrick’s Day? It may seem like you’re the only sober person left in your city – or heck, even your country – but that’s simply not the case. In fact, just 20% of adults of adults plan to consume alcoholic beverages on St. Patrick’s Day. Even if your entire family or group of friends typically down brewskies on March 17th, there are plenty of ways you can enjoy this holiday while remaining sober. From documenting the night for pals to transporting folks around town, here are 4 ways to have a blast this St. Patrick’s Day without consuming adult beverages. Approximately 1 out of 3 driving-related deaths involve alcohol. If you don’t want your loved ones to become part of that statistic, offer to drive them to and from their St. Patrick’s Day shenanigans. You don’t have to actually attend the events with them unless you’re comfortable doing so; you can bring a book or electronic device and wait in the vehicle until they’re ready to leave. Want to make some extra cash while you transport intoxicated passengers? Apply to drive for services such as Lyft or Uber. Stay busy during St. Patty’s Day festivities if you want to avoid the urge to drink alcoholic beverages. One way to do this is by grabbing your camera or smartphone and following your friends around as they engage in drunken adventures. Avoid taking photos of anything that may embarrass them or make them uncomfortable the next day, like if they’re throwing up in a potted plant or falling down drunk in the street. You may find it easier to decline offers for alcoholic drinks if you bring your own beverage with you. Some restaurants don’t allow outside drinks, but you can probably show up with soda, juice, or water if you attend a house party or St. Patrick’s Day parade. You may also want to bring some healthy snacks with you. Sometimes people mistake hunger for thirst, so you may find it easier to resist beer or whiskey if your belly is full. If you’ve battled alcohol addiction or abuse in the past, you’re not alone. More than 15 million American adults have experienced an Alcohol Use Disorder (AUD), and approximately 1.3 million of them have sought treatment from a facility that specializes in addressing this condition. Depending on how well you’re doing with the long-term treatment of your condition, you may find it stressful to mingle with intoxicated people or attend events where alcohol is present. Luckily, there are tons of people who are also in recovery for AUD, as well as people who have never consumed alcohol in the first place. Not sure where to find sober folks? Start your search at Alcoholics Anonymous. This well-known association offers meetings around the world for people struggling with alcohol dependence. Meetings are held 7 days a week, even on holidays, so you can easily find a group of like-minded people to spend time with on March 17th. The organization also offers events for members, such as bowling or swimming, so that may be an option if you don’t want to sit at a meeting. If you’re religious or don’t mind attending a Christ-based treatment program, you can find sober friends at Celebrate Recovery meetings. Meetings aren’t held as often as Alcoholics Anonymous meetings, but you can request for your local church to launch the program if you don’t already have one in your area. You don’t have to spend St. Patrick’s Day cuddled up on the couch with your pets – unless you want to, of course. Follow the tips above to have a fun-filled St. Patrick’s Day without consuming a single drop of alcohol. Author Sarah Lockwood put together The Prevention Coalition after watching her daughter struggle with addiction for years. With The Prevention Coalition, Sarah provides an online forum where loved ones of people dealing with substance abuse can meet and get support. 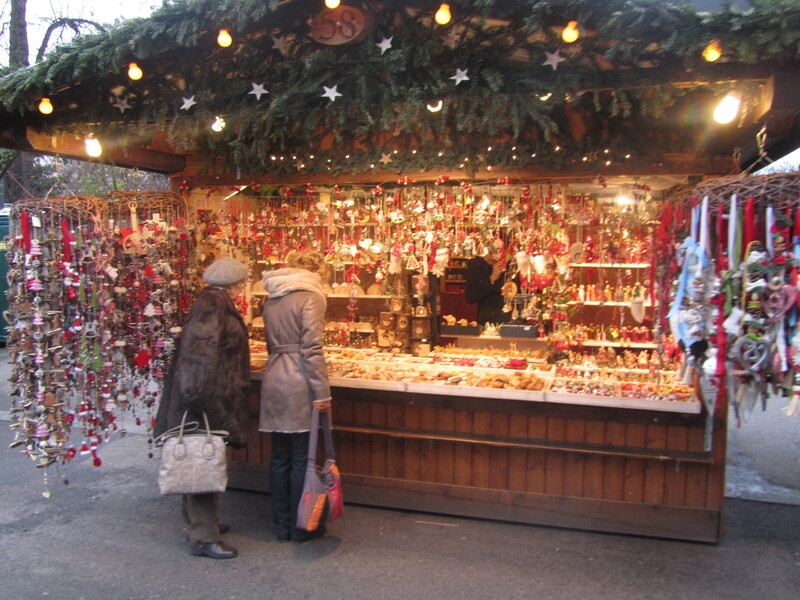 Take a European river cruise to enchanting Christmas markets to get you in the holiday spirit. My sons and I had wanted to do this for a decade and finally went on a Viking River Cruise last December originating in Budapest and terminating in Munich. Although we had been to most of the places before, these cities are very different at this time of year with the incredible wooden stalls decked out in Christmas finery. Pack for both Artic and spring like conditions as weather can be a bit unpredictable. Throw in a few smart outfits for the evenings, but nothing formal. The beauty of river cruises as opposed to ocean ones, is that they are docked in the centre of the city in the midst of the festivities. The Christmas markets are usually about a ten minute walk from the ship, which is lovely for quick strolls after dinner. 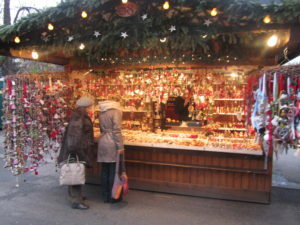 The wooden stalls full of toys, ornaments, food and much more are lit up like a fairyland in the evenings. What is nice about these markets is that one is buying directly from the artists, bakers and toymakers. The markets are often in the heart of the city near the shops, which makes ticking items off your holiday gift list quite easy. 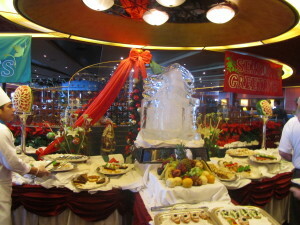 A Christmas river cruise is on a ship of around 100 to 150 passengers. There is much mixing and interactions among the passengers. Meals are open seating with dinner at a specified time with beer and wine included. Activities take place in the lounge and this is a time to mingle with others. One night we had a German Children’s Choir who sang carols in either German or English. They were adorable. There are a variety of lectures, concerts, folkloric dances, a cooking demonstration and so much more. There is an on board library with reference books and games. There are shelves of books that others can take and replace with one that they have read. I really like the cappuccino/hot chocolate machine that is available round the clock. In the afternoons, local cookies and pastries are provided. The young European staff are amazing and the concierge will arrange for tickets, taxis, reservations or whatever is desired on shore. 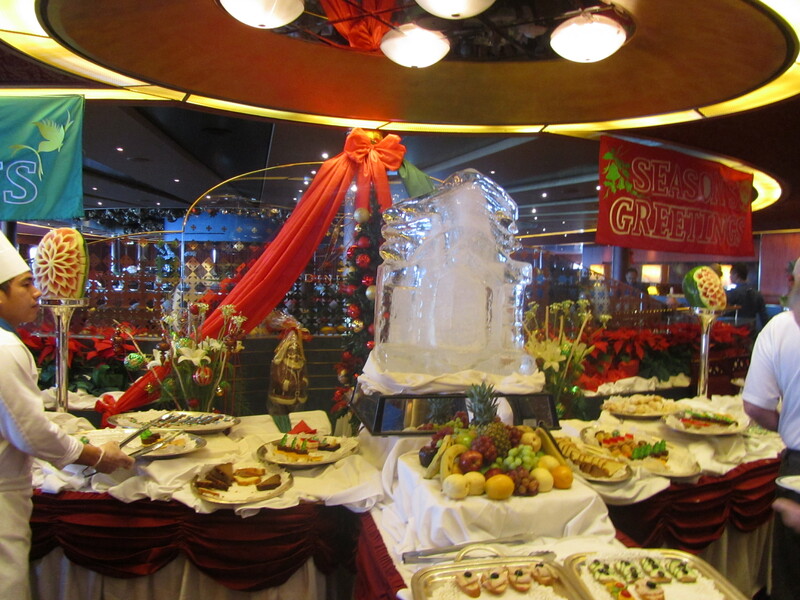 The holiday décor on the ship is exquisite. The markets in various cities have specialities. We got the potato dish in Bratislava and the cheese recolette in Salzburg, and Munich. Bratwurst was prevalent everywhere. Hot mulled wine was available in all of the markets and even in the gingerbread shop in Passau. Budapest had unique baked goods as did the other markets. Viking gives handouts on what to buy, both in crafts and food at each market. They explain what is unique in the markets and cities being visited. Their history of the regions and maps are helpful. Before she had her medical crisis, my mother had demanded that we go on a Christmas/New Year’s cruise to Australia and New Zealand (I am an only child). While on board the ship in Alaska, it seemed like she was whispering in my ear to book the holiday trip for my two sons and me. Holland America kept saying that there was availability, but the pricing was not correct. They had to give the cruise to us at the price on their computer, which was three for the price of one passenger! The day this happened turned out to be the very day my mother passed away. That was her parting gift to us. My travel agent later said that this nominal cost was unbelievable. What a special adventure this turned out to be and a more pleasant way of spending our first Christmas without her company. We flew into Auckland, NZ, checked into our ship, and threw our luggage into our cabin. Several people told us before we left, that Waiheke, a magical island caught in the fifties, was a short ferry ride from Auckland. Indeed it was a fantasy of laid back people in a breath taking environment. The coffee shop, beach, and plethora of flowers just banished any blues. This was our second Christmas since my divorce and we decided to start new rituals. Distraction is a way to divert energy from worrying about troubles, into having positive experiences. There were plenty of diversions in New Zealand, such as going to a wildlife center, a farm to watch sheep shearing, and learning about Maori culture and that was just the first port of call. New Zealand has warm people, stunning fiords, and Napier which is an Art Deco city. We went from a horrible divorce, my mother’s death, to laughing and viewing life in a more light-hearted way. Steward Island, NZ is mainly a nature preserve with citizens that came for a holiday and have stayed for a decade or so, such as the barista in the coffee shop. Bring medicine for sea sickness if you sail from there through the Southern Seas to beautiful Tasmania. After Melbourne, we ended this journey in breath-taking Sydney. Kids will love Sydney as there is so much to do, such as the aquarium and going to Bondi Beach. It can be difficult when Father’s Day does not fall during one’s time with the children. Perhaps a holiday swap is feasible, with trading Mother’s Day or another one for Father’s Day. With my parents’ divorce, I spent the holiday with whoever’s turn it was to have me. Decide if you want to be around others or by yourself on your special day. Sorting out your feelings will be a guide for what to do on Father’s Day. Do something enjoyable. I was on my own for Mother’s Day, so bought a book and went to a coffee shop with comfy chairs where I could linger. Some of my male friends can happily spend a chunk of the day wandering around a large hardware store. Check with the Chamber of Commerce to see what events and activities are happening in your community. Think about taking a guided walk in your own city. One divorced fellow told me he had a great time going on a “Ghost Tour” when living in London. Volunteer on Father’s Day. Charities are particularly short staffed on holidays and can use an extra pair of hands. Shelter dogs have to be walked and the homeless have to eat. Think about what gives meaning to your life and consider volunteering for a non-profit in that area. 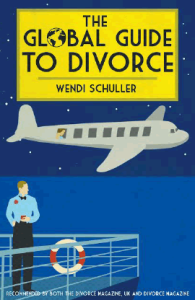 Divorced friends have volunteered at lively festivals, and ushered at concerts and plays. Find out if your family is having a get-together on Father’s Day. Give your dad special attention and take your folks out to lunch. Perhaps you can go over to a sibling’s house and have some fun with nieces and nephews. This can be family time even though your kids are not there. Distraction works great for taking one’s mind off troubles and missing the youngsters. Is there a film you have been longing to see, but is not kid friendly? Are there some projects that you have been meaning to finish? This could be the day to visit an exhibit or museum that has been on your to-do-list. When Mother’s Day comes in the midst of divorce proceedings, it can be upsetting if your children are not scheduled to be with you. Some parents have put in their parenting plans that the kids spend Mother’s or Father’s Days with the parent that is being honored. Others do an informal trade for the day. Post-divorce, my sons and I started new traditions to make the day seem more like it belonged to us. We exorcised the ghosts of Mother’s Day past, and did not do anything like we did when I was still married. We shook up our routine and had a simple meal out followed by an anticipated movie. Celebrate in a new way, whether or not you have the kids with you. My mother was happy to go along with our changes. Here are some ideas for embarking on new traditions for this day. Have a brunch at your place and invite other women, whether or not they are mothers. Make it extra festive with some champagne or Bloody Marys. If you have family nearby, get together with them and the kids will have fun with cousins. Ask your children for suggestions on how to celebrate this occasion in other ways. When I was little, I treated my divorced mother at a reasonably priced restaurant in a nearby town. The scenic drive was half of the fun. Give your kids the chance to do something nice for you. What to do if you are alone on Mother’s Day? See what your single friends are doing, or be the social director and plan an outing with them. Distraction is the key when feeling lonely or melancholy. Going to a cinema or watching a boxed set at home can help. My mother would get a great mystery to read on Mother’s Day when I was not home, or she would work. Sitting around moping makes things worse. Consider getting away on a vacation. You can be with others on a tour, or check off something from your Bucket List. Then you are not around happy families on this day, when you are alone. Pamper yourself with some new spa products. Whatever I do on Mother’s Day, high quality chocolate will be part of it. Some people have chosen to stay together until after the holidays for a variety of reasons. It may be to give the children one last Christmas together. One agony aunt printed a letter from a woman whose daughter-in-law is filing for divorce at the beginning of the year. She questioned what to buy an exiting in-law for Christmas and how to deal with this charade around her grandchildren (who are not informed of the upcoming parental split). The holidays can shine a spotlight on problems that are bubbling up just under the surface. Busy day to day activities with a packed schedule can mask issues that are not being addressed. When one or both have long job commutes or kids with jammed agendas, this enables a couple to pretend that everything is okay. When interacting with each other (or attempting to avoid it) during holiday time off from work, spouses can feel empty inside. New Year’s Eve is just around the corner and many are thinking of how to avoid this whole holiday. Others are celebrating their newly found freedom and will be partying the night away. Decide if you want to be a hermit or around others and plan accordingly. One way to not be alone, yet be distracted from the holiday, is to work. On your job, you can treat the holiday as another work day/evening, or join in the staff festivities and potlucks. When you are serving the public or dealing with projects, your mind will be on the task at hand. Some newly divorced have shied away from small, intimate gatherings and gone for the big galas instead where conversation can be more superficial. One aspect of New Year’s Eve is that couples may be together, similar to Valentine’s Day and less apt to invite single friends as they do for Thanksgiving. I felt lonelier when still married, on New Year’s Eve than I ever did post-divorce. I then celebrated with my mother and sons watching the ball drop while eating a luscious treat. I slept in on New Year’s Day, watched a parade, went to the movies and made a simple, but delicious meal. Think about starting different New Year’s Eve/Day rituals like I did with my sons. It may be offering to babysit your niece and having a pizza party. Kids are a great distraction and provide amusement. If they aren’t yours, then their parents will love you for letting them get some couple time away. Other divorced friends have turned down invitations and enjoyed pampering themselves, such as with a facial mask and a great book. If you don’t want to go out for an expensive feast on New Year’s Day, then meet pals at a coffee shop. The Washington Post had an article that said 49% of adults over 18 are not married (but some still may be co-habituating or in relationships). This is a large number of people not joined at the hip with a spouse on this holiday. About.Com stated that in 2010 of the 11.7 million single parents living with their kids, 9.9 of them were single mothers. That adds up to many single people deciding what to do on New Year’s Eve/Day. The UK Guardian stated that in 2011, married and civil partnerships comprised 47% of the adult population. In the UK, from 2001 to 2011, one person households increased by 1/2 million. What used to be mainly couples celebrating New Year’s is now many singles. This in turn provides new ways to celebrate these two days and with more unattached friends. Whatever you decide to do, have a fun New Year’s Eve/Day and remember to take Milk Thistle supplement to support your liver with the extra alcohol consumption. Budgets may be stretched to the breaking point after a divorce – so think about concentrating on experiences vs a mountain of presents during the holidays. If you reminisce about your childhood, it is the fun times during the holidays that you remember – not the particular Barbie outfit or model airplane received. Taking the focus off materialism and on to what is really meaningful, is a life lesson in itself. The children are now getting two sets of presents after divorce. Do not try to compete with your former spouse in the gift arena nor try to make up for their divorce experience with extravagant material goods. Shift traditions from having the opening of gifts as the main event, to more of a short activity before the festive feast, visiting grandma or whatever. Go to a live nativity and especially enjoy the animals who are stealing the show. A nearby church has one every year with hot chocolate, cookies and carols. The sheep, donkeys etc. are just adorable (and ornery). Walk downtown in the evening and enjoy the festive holiday displays. It is like wandering around in a fairyland of lights. We top that off with lattes and a treat afterwards at a coffee shop which is opened late. Acknowledge your emotions such as sadness. Burying them does not make them go away, but rather backfires when they surface at inopportune times. Recognize that you are facing a loss and are still grieving when the rest of the world seems caught up in the frivolities of the season. What helped me was watching comedies and reading humorous stories. Laughing a lot lessened any pain. Do what works best for you. Many have mentioned that taking a break from their surroundings helped speed them along in healing. Not going to where they celebrated Christmas Eve dinner or to other places that they went as a couple, reduced dwelling in the past. Skipping some holiday rituals that were done when married, contributed to being able to move on. You are making a break from your old life this holiday season and embarking on a new adventure. One way is by taking a trip – whether to the heart of Europe or discovering new sights in the UK. There is something mystical about the Highlands for me. When I was in Australia and New Zealand for two holiday periods with my sons, people did not seem to be depressed. They were busy going to the beach, hiking and enjoying the various outdoor pursuits. The sunshine was a mood lifter during the holidays. The Aussies’ Christmas cheer was contagious during this extended daylight. A divorced friend took a small packaged tour to Asia and had the same experience. She also enjoyed the camaraderie of the other travelers over the holidays along with the sun. In the Northern Hemisphere our holiday season falls in the height of darkness. The perpetual clouds can add to the gloom one may be experiencing post-divorce. The Seasonal Affective Disorder Association (SADA) charity estimates that 21% of UK residents have Seasonal Affective Disorder (SAD) to some degree, which surfaces during the winter months. The symptoms for SAD are: feeling lonely, lethargic, moody, sleep disturbances and finding it harder to be with people. These are also what people can experience after a break-up. It can be extra challenging when someone has the double whammy of having SAD during winters, with a divorce on top or that. Divorce is a way to weed out holiday rituals that have become stale, from the ones with meaning. Revamp your holiday to-do-list with some fresh traditions to start your new life as a single parent. Since it is only my two sons and I in our city, we go to the cinema on Christmas Day for an exciting blockbuster film. 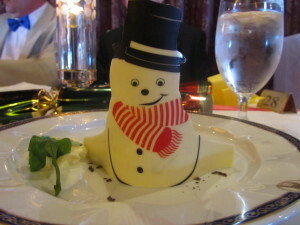 It gives us something fun to anticipate after opening presents and having brunch. Ask the children for input on what they like best about Christmas Eve/Day and their answers may surprise you. Consuming an elaborate dinner that takes hours to prepare may not even be on their Wish List. Getting a pizza or eating comfort food on Christmas Eve while watching a marathon of holiday movies, may be what they desire. Save yourself loads of work by incorporating new, low key traditions into this frenetic Christmas season. My sons wanted to stop the tedious activity of making and frosting sugar cookies. 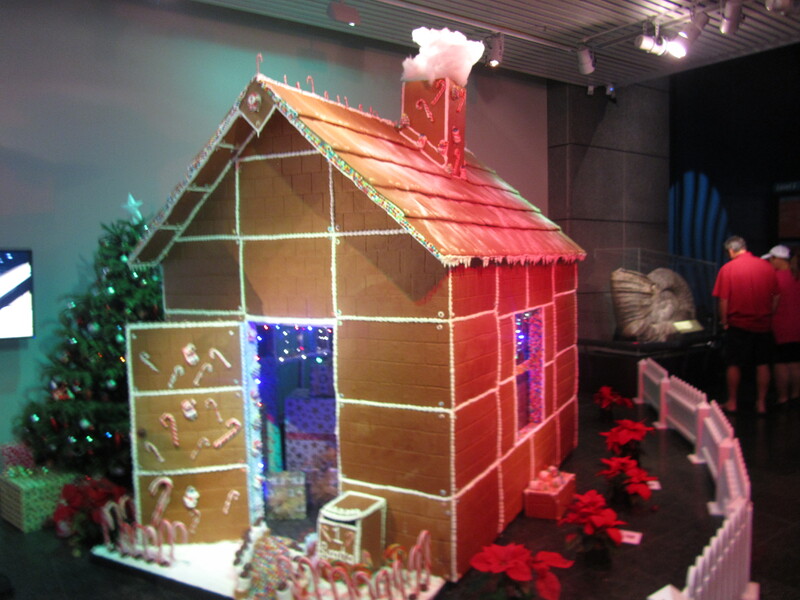 They substituted assembling a pre-cooked gingerbread house from a German kit. They enjoy creatively decorating the house and it is fun instead of a chore. It is the uninterrupted time spent with children that matters– rather than frantically flitting from one holiday event to another. This means turn off your devices and be fully present. My sons and I attended a children’s Christmas concert in Germany last December. These angelic voices were heavenly, yet an American woman in the front row was glued to her smart phone. A few of the young soloists looked hurt as they watched her not paying attention to them. When my now adult sons look back upon our Christmases, it is time spend just hanging out together watching “ The Grinch that Stole Christmas” and others, while downing holiday goodies that means the most to them. It is challenging blending families together and merging holiday traditions. Some families have Christmas Eve as the main celebration and for others it is the following day. The holidays turn into a juggling act – spending a chunk of it on the road going between houses. When two sets of children and four biological parents are involved, having step-siblings spend some holiday time together gets complicated. Both parents may have remarried and have blended families. Step-siblings may desire opening presents together so previous arrangements may have to be altered to accomplish this. The Parenting Plan meticulously sets in place how the holidays are to be divided up, which worked well in the past. When one or both parents get remarried, having kids be with step-siblings over holidays can be a logistical feat. Some parents have gotten around this by having large gatherings for all. Step-parents get to meet the other step-parents with grandparents and relatives thrown into the mix. The kids get to be with everyone. Feel free to mix up traditions. Memories can be attached to certain ones and shaking them up a bit ensures a merrier time. If you always went out for a big Christmas Eve dinner when previously married, turn that around into an elegant Christmas brunch or pub lunch. Do fun activities you enjoy with the kids, but in a different order. That gets rid of the ghosts from Christmas past in order to enjoy the present. Consider starting totally new holiday rituals. Or have family members state one or two holiday traditions that are important to them. See how they can be incorporated into your new family life. It may be tempting to do too much. Yes going to The Nutcracker, pantomimes, parties galore are fun, however downtime is important. Watching “Elf” on TV while munching on pizza is hanging out together and strengthening the family bond. If things seem strained with step-sibling interactions, consider allowing their friends over or inviting your nieces and nephews to join in the holiday fun. On occasion, having extra kids around can help diffuse tension and calm the atmosphere. Do activities with new step-children. Some step-mothers baked Christmas cookies or taught culinary skills to their young family members. Step-dads have done sports with step-sons when their mums were in the kitchen for long cooking sessions near the holidays. Although Blended Families represent a new chapter – they are formed as a result of losses. A couple is brought together due to a death or breakup with a former partner. It is okay for youngsters to display mixed emotions. They can still love a new step-parent while mourning the loss of their former life. Bonds take time to strengthen. The first Christmas as a blended family may be more volatile with the following ones peaceful and delightful. Hang in there, your patience will be greatly rewarded. One way to start new Christmas traditions is to get away from it all and wipe the slate clean after divorce. No more “this was what we did when we were still married last Christmas Eve.” One happily divorced woman who is now my friend, went on a Christmas/New Year’s cruise solo. She chose to surround herself with many people and felt the Christmas spirit. Not needing a date to dance the night away on New Year’s Eve was a bonus. On cruises, there are often get-togethers for the single passengers of all ages. Beats moping around one’s flat when friends are occupied with their own holiday plans. 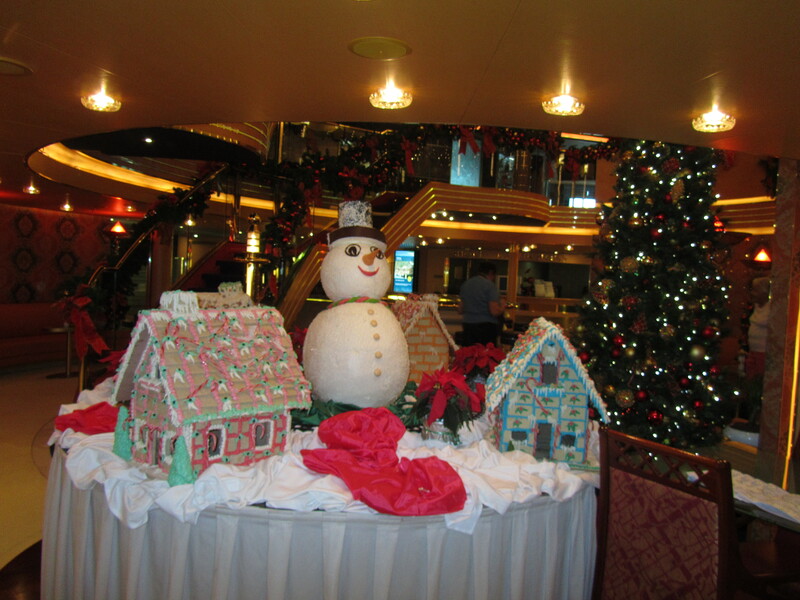 Both my sons and I did two holiday cruises on Cunard’s QE2 with my husband and mother. Then just the three of us did two post- divorce ones on Holland America. The anticipation starts months ahead of time when selecting the destinations. The cruises are a nice mix of exploring other cultures during the day and consuming scrumptious meals on board while possibly being serenaded by a string quartet. It was a unique experience hearing a steel band in the Caribbean playing carols and seeing Gibraltar decked out in Christmas decorations. There are different types of entertainment – concerts, musicals, comedians, magic shows, plus much more. Other activities are lectures, cooking demonstrations, computer classes, quizzes, and bridge, just to mention a few. One can be sociable or chill out reading in a quiet corner. The kids are kept busy and the single parents get some alone time or to interact with other adults. The staff puts on a show and sings carols. The QE2 had a traditional British Christmas which included a hilarious pantomime. 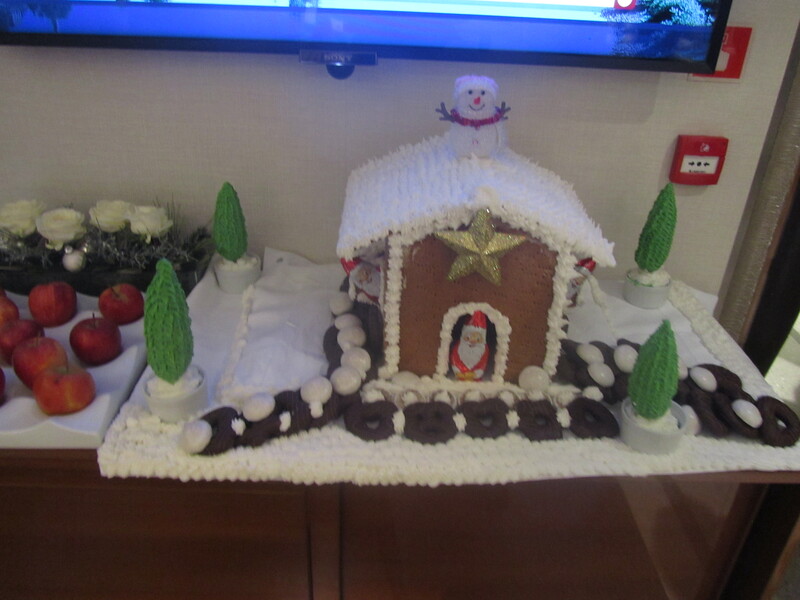 Holland America embraced its Dutch heritage with their special foods and celebrations. Holidays stressing you out? Divorce is a time to start anew and a good excuse to notify others that one is simplifying their life. Divorce can be the catalyst to spend more holiday time with your children and less on making the party rounds or stressing out about getting through your holiday “to do” list. 1. Change your focus from a to-do-list to a let’s-have- fun-list. We check off some holiday activities as if they were chores. Scrap the list, start over, and decide what you and the children really want to do. Making seven kinds of cookies is deleted and baking loads of one kind, like gingerbread, makes the new list. Next year bake a different type or enlist family members to each make their favorite cookies and then share. 2. Decorating for Christmas is fun. Sipping hot cocoa while watching “Charlie Brown’s Christmas” and hanging ornaments on the tree is relaxing. The Christmas wonderland in your house is lovely, but contemplating putting away all of those baubles post-holiday, is not. Avoid that stress by this method. In January, have a fun place for lunch selected or a movie for a certain time. Enlist your little elves to gather the holiday decorations from around the house and put them in one place. Remove the tree decorations and box up everything for storage. It is almost a game at my house and we can get everything down, put away, and the naked tree outside, in one half hour. Then we go to our fun activity. No fuss or nagging. 3. Reduce holiday stress by telling people that since you are divorced, you are making some changes in your life. You are no longer buying presents for the extended family and a long list of acquaintances. You may hear sighs of relief when others tell you they had been feeling the same way. Suggest a simplified plan, perhaps just the cousins get small gifts or one for the whole family. My friends buy a game for the families on their list. We were at the John Lewis store in London, where a salesman plays board games with the customers. The new ones were so enjoyable, that my friends got most of their Christmas shopping done right then and there in September. Valentine’s Day is just around the corner and one can feel like an outcast from Noah’s Ark – where everyone is half of a pair. It is difficult to be alone when it is the first time in a decade or so on this romantic holiday. Here are some suggestions on how to get through this difficult period. A valentine does not have to be a partner, but rather anyone! My four cats are my valentines and we will all devour some treats, me chocolate and them, tuna. If you have children at home, cooking a nice meal together including a decadent dessert will keep you occupied. Babysitting the neighbor’s kids or your nieces and nephews will be engaging and a bit of fun. 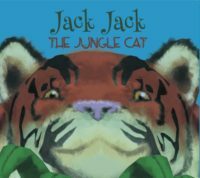 Children and pets are entertaining and a diversion from any gloom. Get out of town and have an adventure! Last year I had a business trip to a large city and arrived early afternoon on February 14th. It was one of my best Valentine’s Days and I was alone. My centrally located hotel was near a lovely bookstore and I purchased a British mystery. I ended up at a department store where I had a facial and bought chocolates. Reading late in a teahouse was heavenly. Sometimes being away from your familiar environment is the antidote to sadness on this particular night. There are plenty of packaged tours that will send you to a glorious place in the sun or to an exotic locale where the holiday may not be a big deal at all. Divorce is particularly challenging during the holiday season. One is used to having a date for New Year’s Eve and now for the first time in several decades, one is alone. Take stock of your situation and decide if you want to be with others or hole up at home. It is nice when family members are nearby and would enjoy your company watching global festivities on the telly (as I did with my mum the first two New Year’s Eves post-divorce). Get in your sister’s good graces by offering to watch your little nephews on that evening. Get the word out among friends and co-workers that you are available to babysit. Plan something fun to do with those extra pounds earned, maybe a spa treatment or two. Near the end of my unhappy marriage, I did taxes one New Year’s Eve. After my divorce, I knew any New Year’s Eves would top some of the ones I had while still married. Putting my life in perspective helped me to move on and enjoy the holiday. If you want to spend New Year’s Eve home alone, you can say that you already have plans, if asked. Otherwise, well-meaning friends may want to drag you along to some gatherings with their social circle. Save an exciting new novel for that evening. Post-divorce, I was on a cruise ship for two New Year’s Eves with my sons. There were extravagant decorations, much fanfare, not to mention the scrumptious nearly midnight buffet. The dance floor was so crowded, that a partner was not required. The festivities included a show, concerts, and a raffle on the second cruise. I won the grand prize of a cruise for two, so my evening was ever so exciting. Consider going away, as several other divorced friends have done. One went on a group tour to India, and she enjoyed the camaraderie of the other travellers. Another women took her kids to Sri Lanka and the hotel was decorated beautifully and her kids learned how New Year’s is celebrated elsewhere. Closer to home are lovely country hotels with holiday packages and festivities. If New Year’s Eve is depressing consider doing your celebrating on New Year’s Day as we do. My sons will be out and about on the Eve, and I will be with my cats. We spend New Year’s Day together. My sons and I watch the telly during brunch, then get a latte out before seeing a film. We come home and have a delicious, but easy meal. People are not paired up on New Year’s Day, as they are on the Eve, so this could be the time to celebrate with friends. 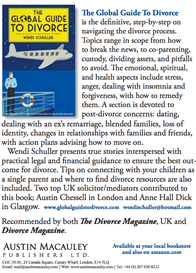 If holidays seem unbearable, consider seeing a divorce coach to get you back on track. Distraction is a good method to get through this holiday when feeling lonely. Get out of your comfort zone and boost your self-confidence and fitness level. Challenge yourself to train and complete charity treks and cycling trips over Valentine’s Day. On February 13th, VSO Charity has a climb up Kilimanjaro and Charity Challenge has a cycling trip from Saigon to Ankor Wat. Great Ormond Street Hospital has a cycling trip around Rajasthan, India starting on the 14th. There are many possibilities such as going to the Rift Valley, Morocco, hiking the Inca Trail, and other exotic locales. Check charity web sites for these adventures and up-to-date departures. Gwen was devastated to be newly single and dreaded being alone. Her adult children were sympathetic, however they had their own lives elsewhere. A girlfriend told Gwen about a charity trek to Kilimanjaro and the two pals commenced training and hiking together. This trek required a certain amount of pledges to be raised for a charity, so these two were busy asking co-workers, businesses, and family to donate money. Gwen and Rose bonded with others in similar situations on this trek and made life-long friends. They felt empowered, fulfilled and loneliness was a thing of the past. Gwen’s children were relieved that she moved on with her life in such a positive way. Some people have done part of a Gap Year for Adults Program post-divorce. There are numerous books, web sites and resources devoted to this subject of doing Gap Year mid-life. A divorced woman over 50 gave a fascinating slide show about her Gap Year installing and maintaining computers in a rural hospital abroad. You discover hidden talents and interests when embarking on these new post-divorce adventures. Facing your first Valentine’s Day during or post-divorce can be like pouring salt into an open wound or a “non-event” as many people disclosed. You may feel like holing up at home screaming at the world, or out and about as if it were any other day. Assess your feelings to see which strategies would work best for you. Those that did not really celebrate Valentine’s Day while married had the easiest time post-divorce. A few who had been married to doctors that either were too busy, or chose not to commemorate this occasion, did not even remember their first Valentine’s Day when newly divorced. Kelly has been divorced twice, yet can only recall recent ones. People who had the most difficult time when newly single, were the ones who had been wined and dined on this holiday. This would be the time to start inventing new Valentine’s traditions that are special for you. Some friends have said that their children have been a happy distraction on Valentine’s Day post-divorce. They have a special dinner and play games or watch a movie. They stated that it is difficult to feel lonely or “poor me” when busy with youngsters. Endear yourself to friends by offering to babysit their little tykes on this night. Invite your niece over for a pajama pizza party and show chick flicks. Veronica had a full-blown party for her young son and his buddies on her first post-divorce Valentine’s Evening with yummy food, fun activities and luscious treats. She was having a great time and was too busy being hostess, to dwell upon any sad thoughts. This is still Veronica’s best Valentine’s Day. Coffee shops and cafes often have a communal table where solo diners can enjoy being around others on Valentine’s Day. These gatherings sometimes become a party, and one couple who met at a restaurant’s singles’ table, are now happily married. After Benny’s breakup, he discovered the communal table at his upscale natural grocery store and spends his holidays there. They have a salad bar and gourmet food that can be eaten on the premises with lattes. He enjoys the camaraderie especially during a holiday and now shuns invitations from his married friends. Erin went to her country club solo for her first post-divorce Valentine’s Day dinner. She forgot that the country club’s clientele was mainly married, so was the only diner at the single’s table.